The Florida Cancer Data System (FCDS) is Florida's legislatively mandated, population-based, statewide cancer registry . The FCDS is a joint project of the Florida Department of Health and the University of Miami Miller School of Medicine. Florida Statute 385.202 requires that each hospital and outpatient facility licensed in Florida report to the Department of Health each patient admitted for treatment of cancer. Information to be reported on each patient include routine personal and demographic data, diagnosis, stage of disease at diagnosis, medical history, laboratory data, tissue diagnosis, and initial course of treatment. The FCDS are utilized by the State and its partners to monitor the occurrence of cancer incidence and mortality, to aid in research studies to reduce cancer morbidity and mortality, to focus cancer control activities, and to address public questions and concerns regarding cancer. The Florida Department of Health contracted with the Sylvester Comprehensive Cancer Center at the University of Miami Miller School of Medicine in 1979 to design, implement, and maintain the statewide cancer registry system, which is known as the Florida Cancer Data System, FCDS. In 1981, the FCDS started collecting case information on new cancers diagnosed and treated in hospitals. Additionally, the FCDS began collecting from outpatient facilities in 1997. The FCDS is the single largest population-based, cancer incidence registry in the nation. Over 150,000 cases are collected from patient medical records annually. Cancer cases are submitted by hospitals, freestanding ambulatory surgical facilities, radiation therapy facilities, private physicians and death certificates. The FCDS database contains approximately 2.3 million cancer records, 3.5 million discharge records and 3.1 million mortality records. Ninety-six percent of all records in the FCDS database are histologically confirmed. Data collected and coded by the FCDS are in accordance with national standards as set forth by the North American Association of Central Cancer Registries (NAACCR), and the FCDS uses the International Classification of Diseases Oncology, 3rd edition (ICD-O-3) to code primary site and morphology. 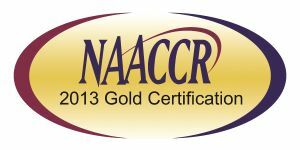 The FCDS is part of the Centers for Disease Control and Prevention National Program of Cancer Registries (CDC-NPCR) and is nationally certified by the North American Association of Central Cancer Registries (NAACCR) at its highest level, Gold Certification. Gold certification is conferred on central cancer registries that exceed all standards for completeness, timeliness and quality.